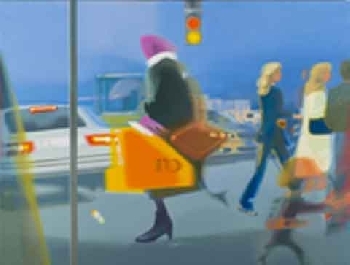 At the Riga Gallery there can be seen Līga Purmale’s solo exhibition „A Diary of a Passer-by” till 29th of October. It is the first artist’s solo exhibition with very new of her work after triumphal solo exhibition „The Visible World” at the State Museum of Art in 2004. 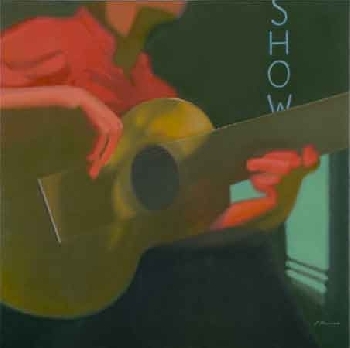 In the exhibition there are 9 new figurative large scale works exhibited. The subject of the exhibition are one day events in the life of a townsman, produced by artist’s imagination and constructed with a techique of illusory, obscure photo shot. For the viewer these events appear via weekday life in town, the rhythm and suuroundings of it, cafes, street crosses and pedestrian crossings, representaters of subculture, street musicians and artists, who produce new symboles and signs via form of graffiti. Either the titles of works are just like fixations of moment – laconic and direct, simultaneously open for interpretations. Painting “4th October” is a variation on selfportrait theme, but the date includes various events with different meanings as well, and one of them is Līgas Purmales birthday. 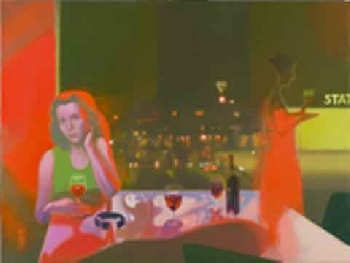 The heroes in paintings are typical men from crowd, whos presence in depicted events show the romantism of city, penetrated with certain moment of solitude – cafe with glasses of wine and a lonely woman, a portrait of lonely “king of the road”, invisible observer behind the glass, which could also be an evaluator of painting. Līga Purmale also continues already earlier started small size serie “Saturday Night Cinema”, where are emphasized problematic issues connected with mass media position and activities novadays. Līga Purmale shows an evening by tv with an information and visual images adequate to our epoch, which includes such popular subjects as sport news, military parade, image of tv diva etc. In the new works Līga Purmale changes her colouring. If previously the colours relatively reflekted reality of nature, now they interflow with surroundings of city, with artificial, neon lights, traffic lights, haziness of streets in organic way. With that kind of means of expression – colouring, composition, obscure observation – Līga Purmale reaches borderline position, which balances between impersonal / objective and fragile sensitivity, enabling us to previse confrontation among intimate and common inside the human. Līga Purmale (b. 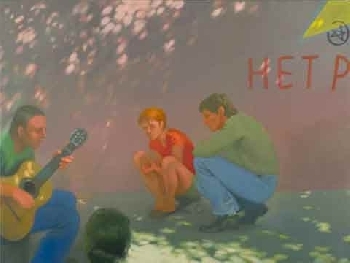 1948) entered the Latvian art scene together with Miervaldis Polis in the mid-1970s. 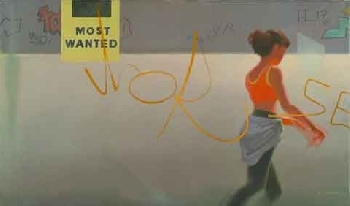 Life styles and creative activities of both artists challenged accepted norms of public behavior. Their life and art were exceptional examples of counterculture. Līga Purmale and Miervaldis Polis can be considered the founders of Photo Realism in Latvian painting. 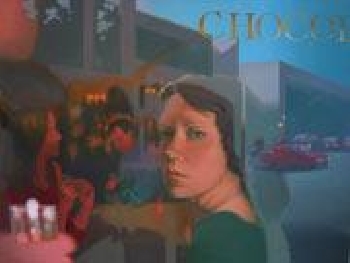 Their joint exhibition in 1974 clearly defined their attempts to achieve in painting such a degree of reality that exceeds the potential of an accurate photograph. Cultivating and developing Photo Realist principles, Līga Purmale has created an individual expressive style and particular conception of landscape. She has taken up several themes in her works – panoramic views of meadows and forests, foggy landscapes, close-ups of nature details as well as urban life and its rhythms. During the last years the artist’s imagery has been expanded by vibrating figures of dancers in pulsating red tones. All these themes she has endowed with certain moods. The artist transforms reality enriching it with various effects. 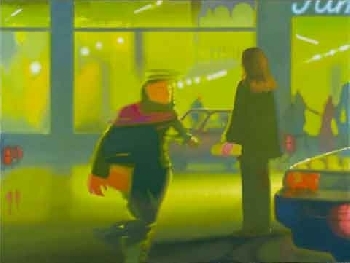 Painterly, subtle “portrayals” of both natural and urban scenes, balanced compositions of colour and light typify Līga Purmale as one of the leading painters of her generation. Although painting is the primary field of the artist’s creative activity; she has practiced also graphics and stage design. Līga Purmale was stage designer for Petr Tchaikovsky’s ballet “Swan Lake” (2002) and Adolphe Adam’s ballet “Le Corsaire” (2003) at the Latvian National Opera. 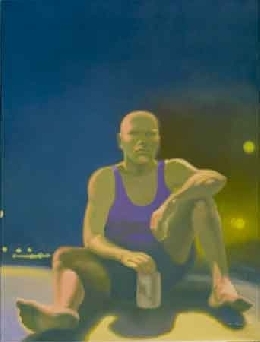 Līga Purmale’s works are included in the collections of the State Museum of Art (Riga), the Artists’ Union of Latvia Museum (Riga), the State Tretyakov Gallery (Moscow), the Klāvs Sīpoliņš Foundation (Canada), Ainars Gulbis privat collection and other private collections in Latvia and abroad, Jane Voorhees Zimmerli Art Museum, Rugers University (USA).